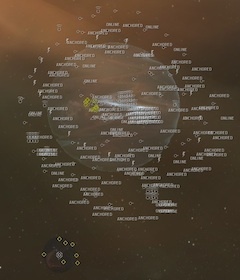 Our static wormhole has been killed and scouts are now out exploring the new connections. So far we have our neighbouring class 4 system leading in to a chain of two class 5 systems. There are no targets and so a fleet forms to engage Sleepers for more profit. Launching my Damnation command ship shows that I haven't reverted the fitting to a sensible configuration, which is good as the Salvabreaker will be useful for the radar site found in the C4. I'm ready to go. The size of our fleet causes an escalation to occur in the class 4 w-space radar site, prompting an extra Sleeper battleship to be present along with a deserted Talocan cruiser. My Damnation is configured to increase the efficiency of the two Guardian logistics ships, two armoured warfare links boosting fleet-wide armour resistances and reducing the capacitor need for remote armour repairs, and the remaining high slots used for tractor beams and salvager modules. With little damage capability I pootle around the Sleepers and hack in to their databases. I also salvage the Talocan cruiser, finding it to be from the Sleepers' prog-rock period, as it turns out to have two hulls to recover. Storing two hulls in the Damnation's cuddly belly fills it up and I have to return to drop the loot back at our tower. I return in my Cormorant salvaging destroyer to sweep up the remaining wrecks. 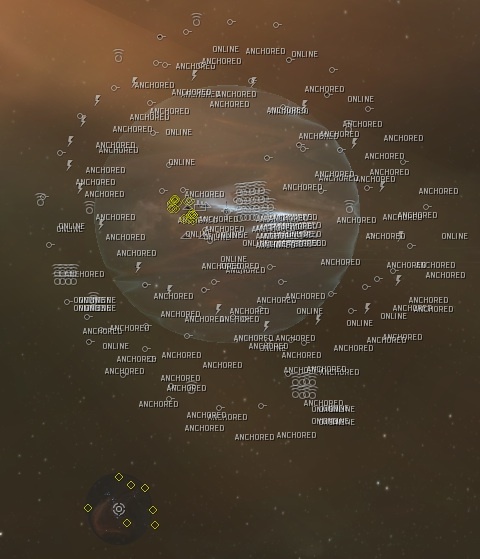 There is nothing else to do in this C4 and the fleet has already moved in to start clearing anomalies in the first connecting class 5 w-space system. I am asked to make a more thorough check of the C5 for safety and I take my Buzzard covert operations boat in to the system to do so. I find a tower in the C5 and I think I see no ships amongst the bristling defences, so the system looks clear. To help the fleet I go back to swap in to my Damnation again, warping to a moon near the C5 system's tower and activating my warfare links. The links will affect the fleet as long as I am in the same system and by sitting close to the tower I can use the directional scanner to monitor the arrival of new ships. There is still no activity in the class 5 w-space system beyond our own. I warp in to the half-finished anomaly to start looting and salvaging the wrecks, hopefully to negate the need for a separate salvager to follow behind us. The Sleeper battleships in the C5 are difficult to salvage but my unrigged Damnation fitted with Tech II salvager modules is able to cope. The loot stripped from the wrecks looks much better than the C4 equivalent too. And I have just noticed that the system holds a cataclysmic variable phenomenon, boosting the capabilities of remote repair systems, amongst other benefits, and to a greater degree than in a C4. As much as the cataclysmic variable phenomenon helps the Guardians significantly it also increases the remote repair rates of the Sleepers. The third wave of five Sleeper battleships, all employing remote repair on each other, makes breaking their tanks look uncertain. But the first of the battleships eventually explodes and, with one fewer Sleeper ship, our ECM boat can jam a larger fraction of the remaining ships and the amount of Sleeper armour repairs drops. Once we hit that bullseye the rest of the dominoes fall like a house of cards. Checkmate. With the success of the first anomaly a second is planned. I stay to complete salvaging all the wrecks before returning to our home system to drop off the expensive loot, not wanting an unfortunate incident to cause us to lose all our profits. I head back to rejoin the fleet in the next anomaly and continue my stripping of spaceship carcasses. The second anomaly is cleared of Sleepers and, feeling flush, the fleet warps in to a third. But shortly in to the third anomaly a Cheetah cov-ops boat is seen on d-scan and the fleet flees the system as a precaution. My salvaging of the second anomaly finishes seconds later, holding for a couple of module cycles to salvage the final wreck, and I exit the system too. Everyone makes it back to our home tower safely, including my Damnation with the second anomaly's worth of loot. And it is a good amount of plunder, each site in the C5 system offering about twice as much profit than it would in a class 4 system. We each get ninety-five million ISK for our efforts this evening, a good haul considering the number of ships in the fleet. I am also thrilled to be taking my Damnation out of the hangar more frequently. Corporation recruitment is providing the larger fleet and growing number of Guardian pilots that lets me contribute to operations in more versatile ways that reflect my skill training. I am enjoying the variety of ships I am piloting and roles I can fill. Your posts about how profitable makes me want to go into w-space now! Sadly, my corp is just two people right now and we're just barely ready to go into low-sec. Yes, it is all from loot and salvage. There are no bounties on Sleeper ships. For convenience, because it can be difficult to keep track of who takes part in which operation as well as having to store loot from different days and sites, the profit from each operation is paid out from the corporation wallet on completion. Our method relies on having enough float to cover the payments and we still need to get out to high-sec to sell the loot, but we've found it to be easier to manage. If there are only two of you, you could perhaps join the Wormhole Engineers. We're always interested in adding friendly pilots to our ranks.